How quintessentially inspired that Lonely Planet’s 500-stop global gastronomy tour begins not with flashiness and flair, but by lauding what’s simple: “battered white asparagus, a tuna and anchovy tart or maybe mushrooms braised in garlic,” enjoyed after a “lazy day” in San Sebastián, Spain. This latest guidebook isn’t about food-tripping for show; it is earnest in its efforts to encourage curiosity and learning on a transnational scale. Try everything, savour every ingredient—let taste be your guide. 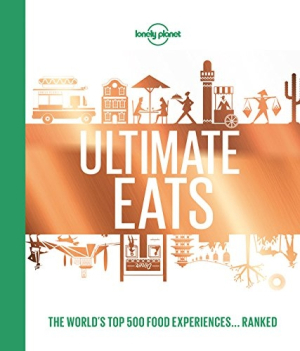 The book’s entries were ranked carefully by a team of culinary and travel experts. Borders may be crossed multiple times on a single page, but every entry ends up celebrating something elemental, situated, and singular. You may have had pho before, but have you had it on a boat in the Mekong Delta’s river market? You incorporate coconut in dishes at home, but have you experienced it beachside in Fiji—“that little gift from Mother Nature … cold, sweet and refreshing,” sipped straight from the fruit? The book celebrates street food alongside Michelin three-star restaurants, and considers the experience as part of the package (sufganiyot are reserved for Hanukkah in Israel; wait to experience Germany’s mulled wine until the nation’s Christmas markets are in full swing). Its exuberance is pure; its sense of adventure is insatiable. An index organizes entries by nation, enabling a quick scan of the must-tastes in your next destination. Colorful ingredients pop in bright photographs of steak tartare in France (the book begs that you not neglect the classics) and paprika-dusted cabbage rolls in Hungary, while wanderlust-awakening pictures of sites are included next to those of mouthwatering dishes. A select team of notable and celebrity chefs lent their own top five recommendations to the project, as seen in sidebars sprinkled along the path: note that mashed potatoes in Paris are how Eric Ripert does it, or follow in Wylie Dufresne’s footsteps and down fish skin tacos in Copenhagen. It would be a shame to come away from this generously portioned project and not hunger for just one more helping, to be downed in a location that is as yet unknown.